4th floor, 2 bedroom, 2 bath, 2 level villa located just across the street from the ocean in the Forest Beach Villas complex. 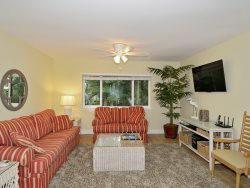 New furnishings bring both style & comfort to this 4th floor, 2 bedroom, 2 bath, 2 level villa located just across the street from the ocean in the Forest Beach Villas complex. 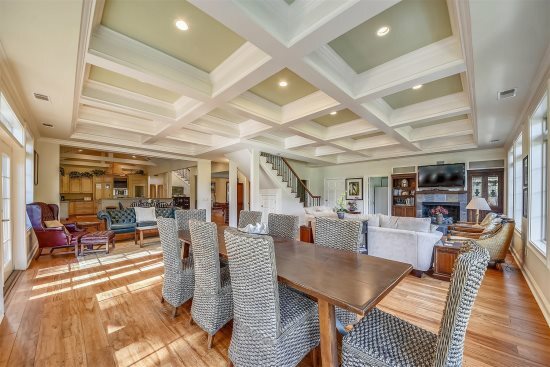 The tile foyer opens to a bright & sunny living room with warm wood flooring, an overstuffed sofa & loveseat, an entertainment armoire with TV/DVD & CD player, a dining area with seating for 4, and a slider door to a balcony with a lagoon view. Off of the living room is a galley kitchen that is equipped with all full-size appliances. A short hallway gives access to an alcove with a full-size washer & dryer, a full bath, and a bedroom with 2 twin beds. On the 2nd level is a very private master bedroom with a king-size bed, an armoire with TV/DVD, a spacious walk-in closet, and a full bath. 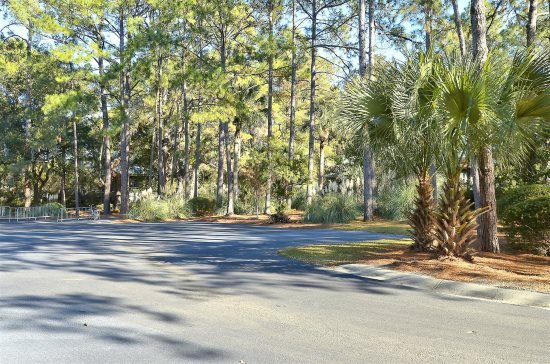 The Forest Beach Villas, in the South Forest Beach area, are just across the street from the beach, have private tennis courts, an on-site pool, and are just a short walk (5 min.) to the shops and restaurants of Coligny Plaza. All beach distances are measured from the center of the complex. Very nice spacious condo. Great location. Very quite and peaceful vacation. Email and telephone correspondence with staff were very professional. Communication leading up to our stay and during our stay was very helpful. Accommodations were also as expected. It was nice trip. We actually ended up staying at two properties, and both were pleasant. The first property was the original one we booked and it was in Bluff Villas. We were actually a bit surprised upon entering the villa because it appeared to be much more updated than the online pictures showed. The furniture seemed to have been updated somewhat. So, that was a nice surprise. However, the HVAC system in the unit broke down while we were there and we moved into another available property in South Forest Beach. That unit was also equipped with everything we needed. Although, it was unfortunate that we had to move from our original unit due to the HVAC system, the staff made sure that we were comfortable during our stay. Megan was the person who handled the issue and she was great! We appreciate her kindness and professionalism. The convenience of not having to stop at the rental office to pick up a key. The keypad system is great! love the location of the property we stay in. Great location and wonderful condo.